So you didn’t make it to the Salt Lake Institute of Genealogy (SLIG) in January. And you didn’t register for the Institute of Genealogy and Historical Research (IGHR) or the Genealogical Research Institute of Pittsburgh for their June offerings. And you didn’t make it in to the 2016 Genealogical Institute on Federal Records (Gen-Fed). All of these institutes — what we call “summer camp for genealogists” — and you’re not in yet? So what are you going to do to jumpstart your genealogical education for 2016? If you don’t mind a suggestion, there’s one more really good option that opens at noon Eastern time, tomorrow, Wednesday, March 2nd, for the classes of the July session at GRIP — and those classes are going to fill up fast. 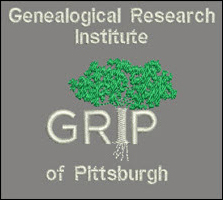 GRIP, of course, is the Genealogical Research Institute of Pittsburgh, going into its fifth season at LaRoche College in Pittsburgh. Co-directors Elissa Scalise Powell, CG, CGL, and Deborah Lichtner Deal have arranged for terrific courses offering in-depth immersion for an entire week — this session runs from July 17th to July 22nd — in a topic that just might be what you’re looking for. Coordinator: CeCe Moore, with instructors Elizabeth Balkite, MS, CGC; Blaine Bettinger, Ph.D., J.D. ; Brianne Kirkpatrick, MS, LGC; and Debbie Parker-Wayne, CG CGL. If you believe that you are ready to graduate from the basics of genetic genealogy and take the next step in genetic genealogy education, then this is the course for you. Be prepared for a fast-paced learning experience intended for the genealogist who has experience applying DNA testing to family history research and has a strong foundational understanding of genetic genealogy concepts. Coordinator: D. Joshua Taylor, MA, MLS, with instructors Catherine Becker Wiest Desmarais, CG, and Diane Florence Gravel, CG. When encountering New England roots, many find a rich treasure of previous research, compiled materials, and records dating back to the early 1600s. Yet, within the branches of our New England roots exist assumptions, errors, missing individuals, and incomplete information. Starting with the colonial period and moving to the 1850s, “Diving Deeper into New England” will take an in-depth look at New England research, specifically focusing on little-known and underused sources. Individual sessions will provide a deeper historical and social context for New England research, provide specific tools for key New England states, and provide an overview of the research process through a variety of examples and case studies. In addition, optional homework assignments and discussion time will allow time for you to gain advice on your personal New England research with the course coordinator. Coordinators: Harold Henderson, CG; and Kimberly Powell, with instructors Thomas W. Jones, PhD, CG, CGL, FASG, FNGS, FUGA, and Melissa Johnson, CG. When the research is over, what next? How do genealogists transform the three-dimensional complexity of evidence into a coherent, understandable, written proof argument? This course will include both lectures and case studies demonstrating how published authors analyze, correlate, resolve contradictions, and write, and workshops providing hands-on practice with a variety of tools and techniques for making data understandable in written form. Those who choose can get daily feedback by having their work displayed and discussed on screen in class. The instructors’ approaches will also be up for critique. This course will not have much to say about research or citations. This course will also not include a list of ironclad rules that guarantee the production of a convincing proof argument every time. There are no such rules. It will, however, include a healthy dose of tools, techniques, and strategies to assist with analysis, organization, and writing. It will also feature examples of a wide variety of published proof arguments where you may find a model for your own pesky problem. Coordinator: Paula Stuart-Warren, CG, FUGA, with instructors Debbie Mieszala, CG, and D. Joshua Taylor, MA, MLS. What’s the next step in your research and also your genealogy education? Have you moved beyond the beginning stages of researching your family history? When we have checked the basic records and done online searches but still have blanks to fill in, we need to gain more leads and do a better job of analyzing the records. We will delve deeper into a variety of records, some that you may have never heard about, and where they may be accessed. During the week there will be some hands-on projects, small group discussions, and full class interaction as we develop research plans, delve into the records, and learn what may help to solve problems and fill in those blanks. The class covers 19th through 21st century U.S. records and online resources. Prior to the course students will be able to send the coordinator a brief research issue of their own along with a listing of the U.S. places where their ancestors resided. The course includes some “homework” that is optional but strongly suggested. Students often find they like those learning exercises. An extensive syllabus including online resources is provided. While not required, it is suggested that you bring along a netbook, laptop, or electronic tablet for taking notes and for research on the week’s projects. Make sure you bring a copy of some of your own family history research (either as a database or in paper form) to use in putting your new learning to work. Coordinator: Debbie Parker Wayne, CG, CGL; with instructors Blaine Bettinger, Ph.D., J.D. ; Patti Hobbs, CG; Karen Stanbary; and Thomas W. Jones, PhD., CG, CGL, FASG. With required pre-readings, this course will cover the basics and practical applications of genetics to genealogy, ranging from the various types of DNA testing and their use in determining relationships, to company and third-party tools for DNA analysis, from ethnicity estimates to ethics. Coordinator: Melanie D. Holtz, CG, and instructors Suzanne Russo Adams, MA, AG and Paola Manfredi, AG. Genealogical research in Italy is exciting and varied! A rather young country, Italy was formed by combining multiple city states during Italian Unification (1865-70). However, not all areas of current-day Italy were a part of this process and some were absorbed into Italy by treaty during the twentieth century. Understanding the history of this beautiful country is key to understanding what records will be found and what language they will be written in. This course will give you a solid understanding of Italian research and will expand your skills and reveal how to go beyond some of the basic record types. You’ll learn about genealogical evidence and information and how we can apply these concepts to the records of our ancestors. We’ll discuss adding cultural context to your family history and what to do when your research encounters an ancestor who was abandoned. Several case studies will be presented which will demonstrate genealogical methodology, as it applies to Italian research, and you will learn about some of the lesser-used resources that can be used to extend your family tree. Coordinator: Thomas W. Jones, Ph.D., CG, CGL, FASG, FUGA, and instructors Judy G. Russell, J.D., CG, CGL; Pamela Boyer Sayre, CG, CGL; and Richard G. Sayre, CG, CGL. Participants will develop advanced genealogical research, analysis, correlation and compilation skills. Hands-on activities, using original records, will enhance this learning. Examples are drawn from American states and colonies and European countries. Before the course begins participants will complete two pre-course reading assignments. Four homework assignments, providing opportunities for advanced skill development, are optional. Because this line-up is so solid, class space is going to go fast. If you want in, you need to be ready to go when registration opens tomorrow (Wednesday) at noon Eastern, 11 a.m. Central, 10 a.m. Mountain and 9 a.m. Pacific.